The future of La Loggia dei Lanari is focused on increase the value of an ancient identity. Here there was the Sopramuro’s prison where in 1202 the young Francesco was incarcerated, as a prisoner of war, during the conflict between Assisi and Perugia. The imprisonment was a crucial moment of the change of Francesco: from merchant and warrior to what he would become, the Saint of Assisi. The City Council has decided to make this place a fundamental stage in the franciscan path offering to pilgrims and visitors from around the world an environment that could restore, with both historical rigor and highly suggestive impact, the situation experienced by the young Francesco and his feelings in those moments. Mayor Wladimiro Boccali, Father Bruno Ottavi, Provincial Minister of Umbria’s Minor Friars and Rossella Vasta, representing the Knights of Saint Francis, the California’s association that will contribute financially to the operation and also the archbishop of Perugia, monsignor Gualtiero Bassetti attended the meeting to present the project. 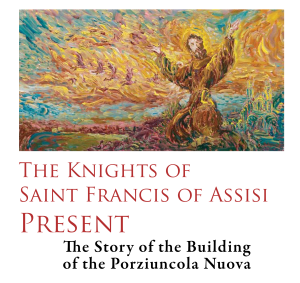 Mayor Boccali recalled having had meetings with delegations of the Knights of Saint Francis (Cavalieri di San Francesco) from 2011, guided by Angela Alioto, which has succeeded in creating, thanks to the authorization of the Assisi’s Minor Friars, a copy of the Porziuncola where millions of visitors are passing through every year (was inaugurated on 2008). From these meetings the idea of making La Loggia dei Lanari a place that would witness the presence of Saint Francis in Perugia” – said the Mayor of Perugia. The Mayor Boccali has also noted how significant is that this initiative starts on the eve of the arrival of Pope Francesco in Umbria. A large sculpture, “Verso la luce”, made by two young umbrian artists, Mattia Savini and Matteo Peducci will be placed inside the Loggia. It’s Francesco during his imprisonment absorbed in contemplating beloved Assisi by the window. The scene represents the young saint that hides the Gospel. 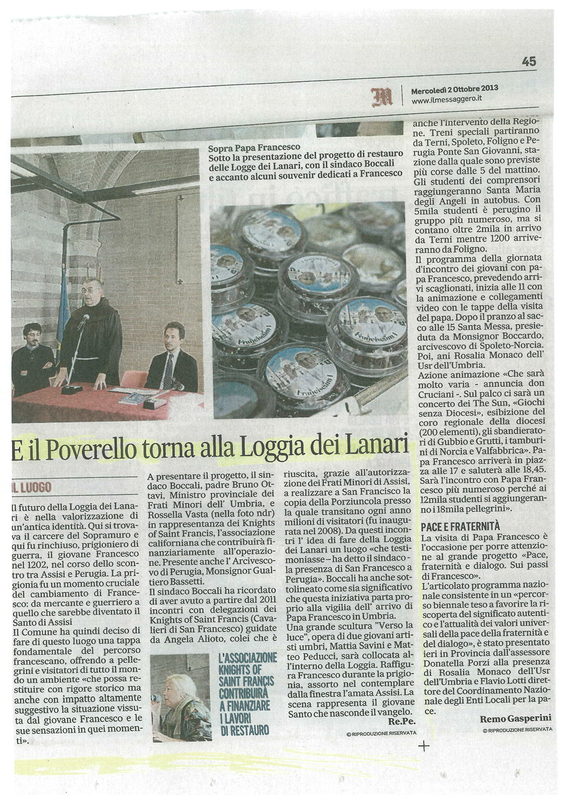 (in the picture above is written: below the presentation of the restoration project of Logge dei Lanari with Mayor Boccali and some souvenirs dedicated to Francesco). (in the picture below is written: The association Knights of saint Francis will contribute to financing the restoration works). Savini&Peducci’s sketch has been presented and it represents the imprisonment in Perugia of St. Francis. PERUGIA. – La Loggia Dei Lanari, located in the center of Perugia, in which there was the Sopramuro’s prison and where in 1202 the young Francesco was imprisoned during the conflict between the city and Perugia, will become a destination of the Franciscan path. The City Council has decided to offer an environment to pilgrims and visitors that could restore the situation experienced by the Poor Man (Poverello) and his feelings in those moments. A large sculpture will be placed inside Loggia Dei Lanari’s locals. The decision was announced during a meeting that was attended by Mayor Wladimiro Boccali, Father Bruno Ottavi, Provincial Minister of Umbria’s Minor Friars and Rossella Vasta, representing the Knghts of Saint Francis, the California’s association that will contribute financially to the operation. Also the archbishop of Perugia, monsignor Gualtiero Bassetti attended the meeting. Mayor Boccali recalled having had meetings with delegations of the Knights of Saint Francis (Cavalieri di San Francesco) from 2011, guided by Angela Alioto, which has succeeded in creating, thanks to the authorization of the Assisi’s Minor Friars, a copy of the Porziuncola where millions of visitors are passing through every year (was inaugurated on 2008). “Hence the idea of making La Loggia dei Lanari a place that would witness the presence of Saint Francis in Perugia” – said the Mayor of Perugia. The Mayor Boccali has also noted how significant is that this initiative starts on the eve of the arrival of Pope Francesco in Umbria. The sculpture, “Verso la luce”, is the work of two young artists, Mattia Savini and Matteo Peducci. It represents Francesco during his imprisonment absorbed in contemplating Assisi by the window. “A testimony of one year of imprisonment that was very important to Francesco, because here comes his conversion”, as pointed out by Father Ottavi. iI is also a symbolic message that invites “everyone to come out of their prison”. The work will be placed inside La Loggia dei Lanari that will become a fundamental stage in the franciscan path. 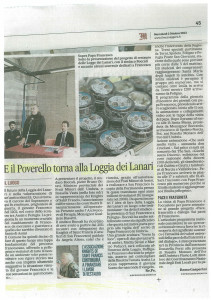 The future of La Loggia dei Lanari is focused on increase the value of an ancient identity. Here there was the Sopramuro’s prison where in 1202 the young Francesco was incarcerated, as a prisoner of war, during the conflict between Assisi and Perugia. The imprisonment was a crucial moment of the change of Francesco: from merchant and warrior to what he would become, the Saint of Assisi. The City Council has decided to make this place a fundamental stage in the franciscan path offering to pilgrims and visitors from around the world an environment that could restore, with both historical rigor and highly suggestive impact, the situation experienced by the young Francesco and his feelings in those moments. Yesterday there was a meeting that was attended by Mayor Wladimiro Boccali, Father Bruno Ottavi, Provincial Minister of Umbria’s Minor Friars and Rossella Vasta, representing the Knghts of Saint Francis, the California’s association that will contribute financially to the operation. Also the archbishop of Perugia, monsignor Gualtiero Bassetti attended the meeting. Mayor Boccali recalled having had meetings with delegations of the Knights of Saint Francis (Cavalieri di San Francesco) from 2011, guided by Angela Alioto, which has succeeded in creating, thanks to the authorization of the Assisi’s Minor Friars, a copy of the Porziuncola where millions of visitors are passing through every year (was inaugurated on 2008). From these meetings the idea of making La Loggia dei Lanari a place that would witness the presence of Saint Francis in Perugia” – said the Mayor of Perugia. The Mayor Boccali has also noted how significant is that this initiative starts on the eve of the arrival of Pope Francesco in Umbria. The sculpture, “Verso la luce”, is the work of two young artists, Mattia Savini and Matteo Peducci. It represents Francesco during his imprisonment absorbed in contemplating Assisi by the window. The scene represents the young saint that hides the Gospel. The work will be placed in such a way to allow the shadow projection of the window on the body of Francis. “A testimony of one year of imprisonment that was very important to Francesco, because here comes his conversion”, as pointed out by Father Ottavi. iI is also a symbolic message that invites “everyone to come out of their prison”. During the press conference were shown two video contributions: a message from Angela Alioto from San Francisco and the description of the sculpture and its meaning. Re-open to the public La Loggia dei Lanari and combine its spiritual franciscan value with the historical and artistic aspects of the city is a key step to include Perugia as a key destination of the franciscan tourist track. THE FUTURE of Loggia dei Lanari is focused on increase the value of an ancient identity. Here there was the Sopramuro’s prison where in 1202 the young Francesco was incarcerated, as a prisoner of war, during the conflict between Assisi and Perugia. The imprisonment was a crucial moment of the change of Francesco. The City Council has decided to make this place a fundamental stage in the franciscan path offering an environment that could restore, with its historical rigor the situation experienced by Francesco. The meeting was attended by (photo) Mayor Wladimiro Boccali, Father Bruno Ottavi (Provincial Minister of Umbria’s Minor Friars), Rossella Vasta of the California’s association and the archbishop of Perugia, monsignor Gualtiero Bassetti. A large sculpture (“Verso la luce”), made by two young artists, Mattia Savini and Matteo Peducci, will be placed inside La Loggia dei Lanari.